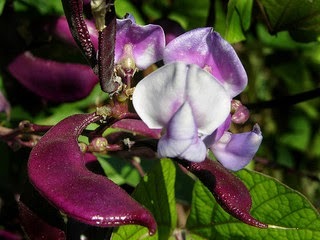 L. Lablab purpureus, formerly Dolichos lablab, Eng hyacinth bean, Egyptian kidney bean, mouse’ ear vine. Lablab is from Arabic describing the rattle of the beans in the pod. They are thought to have originated in India and from there during ancient times spread to China, Western Asia and Egypt. The tropical vine is grown annually. It grows rapidly up to 12 feet tall. It produced purple flowers like sweet peas in bloom in mid-summer. The seed bods that follow are purple. They hang from thin purple tendrils. The deep purple veins of the leaves are especially seen from the underside. white, purple, brown, red or black. 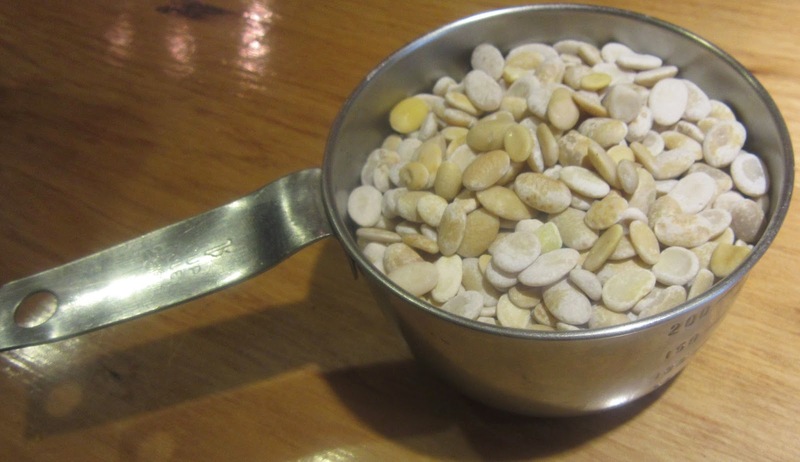 They should not be confused with fava beans (L. Vicia faba mino), see haba although the fava bean seems to have replaced the hyacinth bean since medieval times. Soak beans overnight. Rinse well and put in a pot. Cover with water, add herbs and spices in a spice bag and bring to a boil. When it starts to boil, add the bone, ear and tail. In the meantime, gently fry the onion and garlic with the bacon fat. Add them to the beans. Add salt to taste. Boil gently for a half hour. 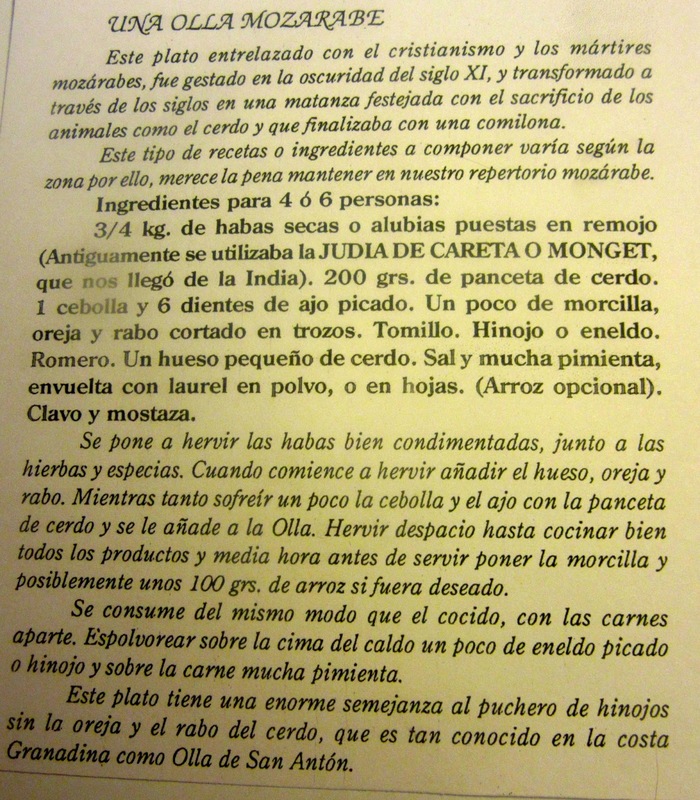 Add blood sausage. If desired, add rice. Let cook 20 minutes more or until the sausage and rice are cooked. This is served like Cocido. 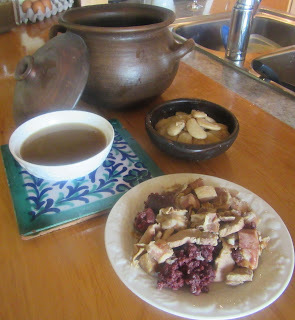 The broth is served first in Madrid or as a second course in Asturias. The meats are placed on one platter and the beans in a bowl and accordingly both are served as the first or second course. Sprinkle ground dill or fennel on the broth. Sprinkle pepper over the meat. This dish is much like fennel soppes without the ear and tail, which is well known on the Granadine coast as Olla de San Antón. 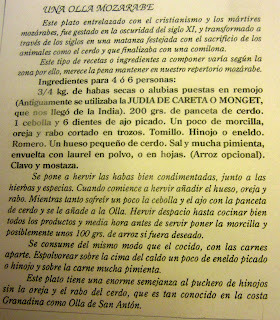 A dish prepared by Christians living in territory occupied by Muslim in Spain until the end of the 11th century.